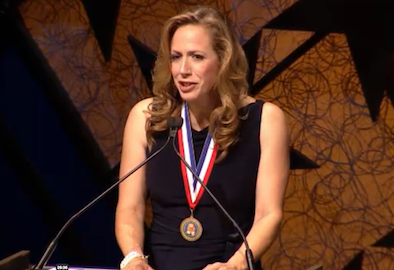 Wednesday night at the Kennedy Center, Wall Street Journal editorial board member and Potomac Watch columnist Kimberley A. Strassel received one of four 2014 Bradley Prizes – with a stipend of $250,000 – at the Lynde and Harry Bradley Foundation’s eleventh annual awards ceremony. WaPo columnist George Will served as the evening’s master of ceremonies. The conservative organization supports strengthening American foundations and selected award recipients among 200 nominees who “set the standard in their respective fields,” according to President and CEO Michael Grebe. Strassel joined Dow Jones & Company in 1994, working for The Wall Street Journal Europe in Brussels and then in London. In 1999, she transferred to the paper’s New York bureau and soon after, the Journal’s editorial page. She assumed her current position in November 2005. 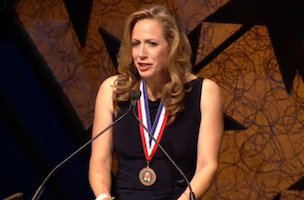 In addition to Strassel, prize recipients included Georgetown law professor Randy E. Barnett, Goldwater Institute President Darcy Olsen, and New York-based WSJ drama critic and commentary critic-at-large Terry Teachout.